Our patented SiPsHitch™ linear force monitoring system alerts operators to potential overstress situations before damage can be caused to the aircraft or towing equipment. SiPsHitch™ affords never-before-seen levels of protection in towbar push-pull operations. 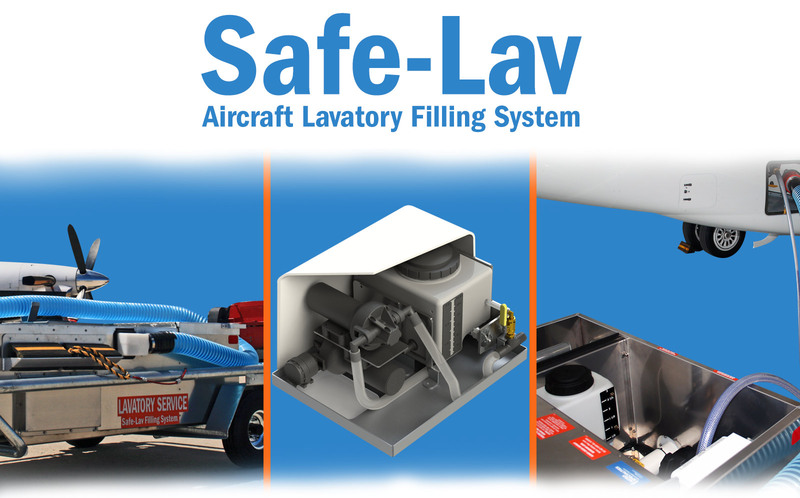 Our patented Safe-Lav aircraft lavatory service filling system prevents costly damage caused by lavatory system overfills, protecting your aircraft in the case of broken meters or inattentive lavatory service personnel. This system is ideal for corporate aircraft. The Aircraft Safe Docking system uses 3D sensing cameras to prevent equipment from approaching the aircraft too quickly. 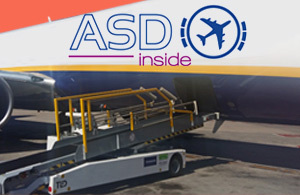 By automatically preventing damaging collisions, the ASD system makes GSE-caused fuselage damage a thing of the past! 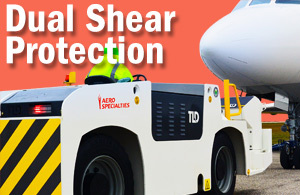 Our towbar heads with dual shear protection offer the ultimate in aircraft & GSE protection. AERO towbar heads offer both linear & radial shear protection, meaning that your aircraft is protected from towing damage at all angles. 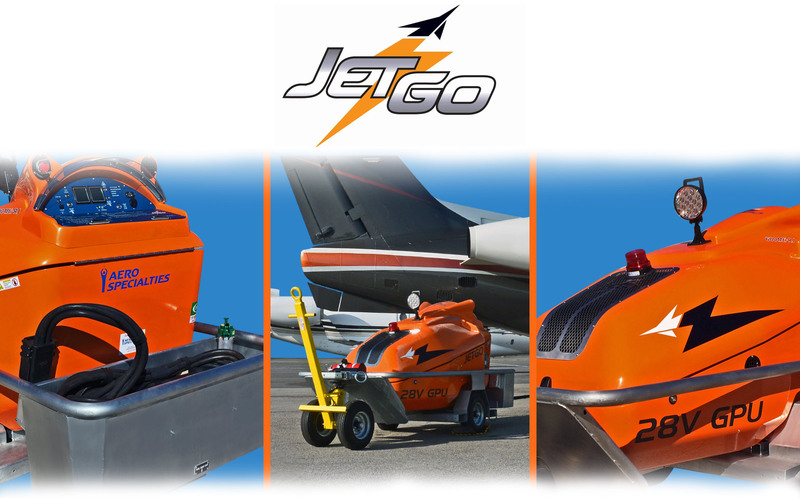 Our JetGo diesel-hybrid ground power units are available with several aircraft safety features, such as the safety cable interlock system. This system alerts the user if the GPU is moved while the cable is still in the aircraft, preventing costly aircraft damage. 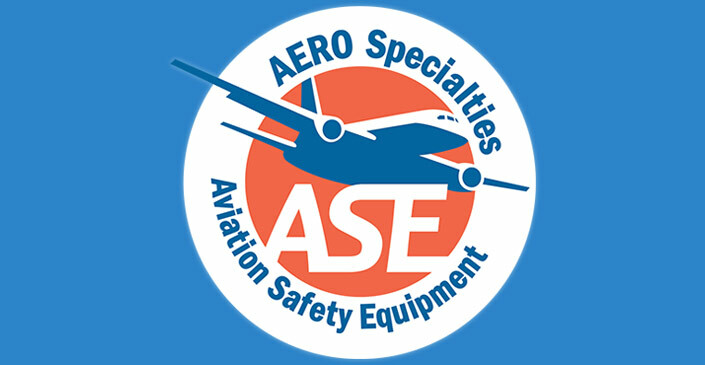 From our towbar heads with dual shear protection to our retrofittable aircraft safety kits, we are expanding the ASE system into all aspects of our business. Our goal is to make our equipment the safest choice for your aircraft. Distractions, unfamiliarity with aircraft type and lack of proper training are just a few things that can lead to expensive aircraft towing incidents. Our patented SiPsHitch™ Linear force monitoring system will alert operators to potential overstress situations BEFORE they cause nose gear damage. SiPsHitch™ affords never-before-seen levels of protection in your aircraft towbar push-pull operations. SiPsHitch™ offers protection from obvious catastrophic failures, as well as the ability to record the invisible stresses that can lead to problems later. How do you know if you’ve overstressed the nose gear during the last tow? 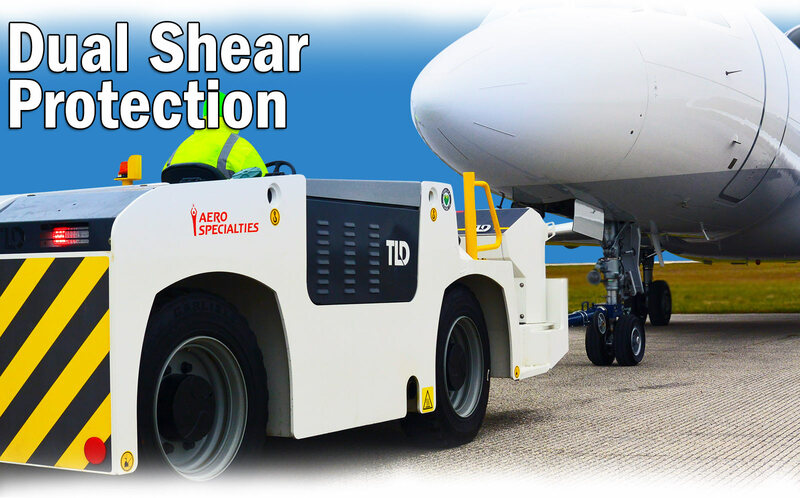 If the shear pin broke, can you say with certainty that the aircraft was not damaged? Can you prove it? SiPsHitch™ eliminates the uncertainty by recording all forces applied to the nose gear, protecting both pilots and service providers. SiPsHitch also makes a great training assistant for new tractor operators. By instantly seeing what the limitations are as they happen, operators will intuitively learn how to tow the aircraft safely and smoothly. 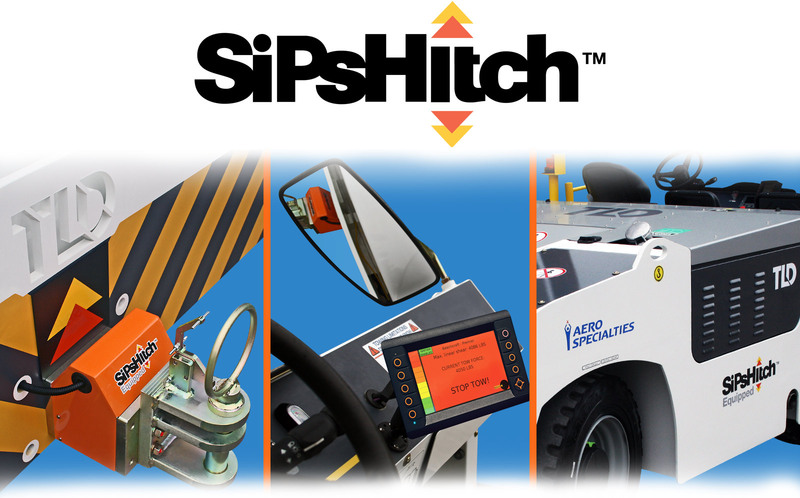 If the operator applies excessive force, SiPsHitch™ will sound the alarm before damage is caused and ask for a supervisor override before the tow is allowed to continue. You may end up with the safest tow team on the planet. When you have the ‘SiPsHitch™ Equipped’ placard on your tractors, customers and insurance companies will recognize that you’ve gone the extra mile to insure the safety of the aircraft. With SiPsHitch™ on board, you have a leg-up on your competition. Affordable and easily installed, SiPsHitch™ will fit all existing towbarstyle tractors. Why wait for disaster, eliminate it with SiPsHitch™! Newer tractors are incredibly powerful and can easily exceed nose gear force limitations. 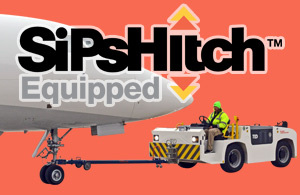 With the SiPsHitch™ system installed you can confidently use a larger tractor for lighter aircraft towing duties. Aircraft are damaged constantly by attempted tows with wheel chocks in place or with the aircraft brakes set. SiPsHitch™ makes incidents like this a thing of the past by alerting the operator before damage is done. Towing an aircraft over soft ground or carrying out a recovery operation? If you attempt this without SiPsHitch™, you might end up making things worse by damaging the gear. The SiPsHitch™ system can be added to new or existing tugs. Add the monitoring system between your tug and hitch, and use the onboard screen to control the system and view realtime data. AERO’s patented “Safe-Lav” system utilizes a dedicated batching tank to determine the maximum quantity of fluid that can be delivered to the aircraft lavatory system. Our direct-reading tank & delivery system is unaffected by inaccurate or broken flow meters (which are the leading cause of messy lav system overfills). 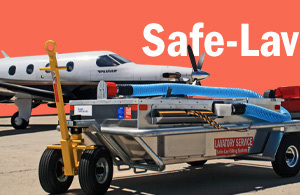 The “Safe-Lav” system is available for all new AERO Specialties lavatory service carts. It is also available as a retrofittable kit for any lav cart. It is available as a single system or dual system (dual system includes both clear and blue batch tanks). The safety interlock system can be installed on our JetGo diesel-hybrid 28V ground power units. This system utilizes a flashing beacon and 100+ dB alarm to alert the operator if the GPU cable is not properly stowed before towing. This prevents damage to the aircraft and GPU in the case of operator error. JetGo units feature numerous aircraft protection measures. The fully automated operation allows for uncomplicated servicing. The JetGo’s under and over voltage protection prevents damage to delicate electrical components. The fine, variable voltage adjustment means they can handle the most sensitive aircraft. The extremely low voltage ripple provides security for the latest avionics. Hot starts can spell big trouble for your aircraft engines and should be prevented at all costs. 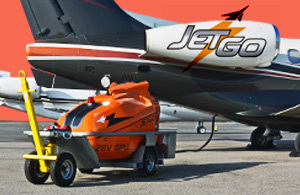 The JetGo’s failsafe 24V DC battery pack provides continuous power if the engine should stop, preventing turbine hot starts and damage to aircraft engines. As the driver approaches the aircraft, he enters the safety area. The operator reduces his speed and presses the ASD button to activate the system. Immediately, a dedicated flashing beacon alerts the management and the other operators on the ramp that the equipment is now in safe mode. In this area, the GSE speed is limited to 5km/h, and the proximity sensor, associated to a sensitive bumper, is activated. The sensor is a 3D camera able to detect any obstacle in front of the GSE up to 7 meters (fuselage, engines, other GSE, other operators…). A buzzer warns the driver if he gets too close to the speed limit and in case of slow or no reaction from him, the system will automatically stop the equipment. 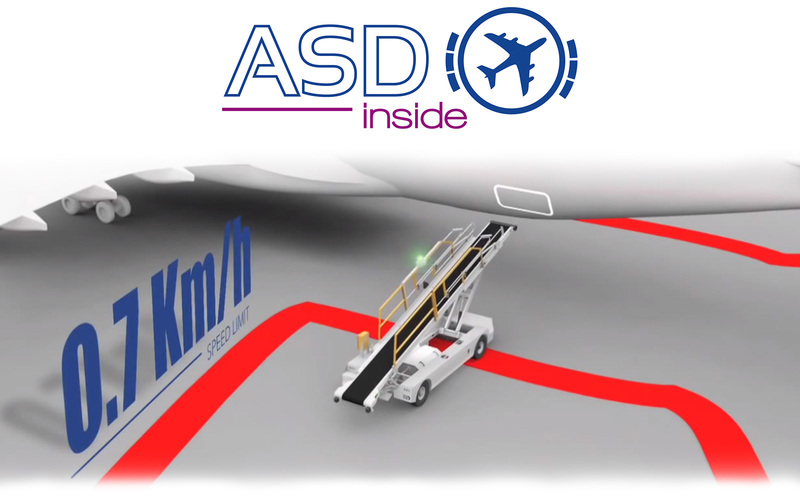 The ASD system prevents equipment from approaching the aircraft too quickly, avoiding damage to the fuselage. Some of the most costly accidents in the aviation industry occur from towing mistakes. Applying too much force to the aircraft can cause shocking amounts of damage – including overstress damage to the nosegear and landing gear. Our towbar heads with dual shear protection feature independent shear bolts for both linear & radial protection. The bolts will break if too much force is applied in any direction, protecting other equipment from damage. Just in case your shear bolts break, we include extras with every head. Replacement shear bolts are easy to order on our 24/7 online store. Want to Request a Quote? Need More Info?